Whether your floor is in a greasy pub or restaurant, a heavily trafficked hotel reception or just a living room it is going to need maintenance of some description. The level and type of maintenance is going to be dictated by the degree of soiling and the type of finish that is on the wood. However, the results can be truly astonishing for a lot less than the price of a re-sand. Your local Ultimate Floor Sanding contractor can advise you on your regular cleaning regime but there are also more involved processes that he can carry out for you that will help prolong the life of you floor. The process will always start with an assessment of your floor to ensure that the physical structure and the finish itself are suitable for maintenance. In a commercial establishment it will always be necessary to carry out a deep clean first using heavy rotary cleaning machines and scrubbing pads. The treatment after that will depend on whether you have an oiled floor, a lacquered floor or one finished in Hard Wax Oil. Once an oiled floor has been thoroughly cleaned and allowed to dry in most cases it will be ready to re oil with no further treatment. Occasionally it may be necessary to abrade the floor to “open it up” and allow the oil to penetrate deep into the wood. On bare wood patches it may be necessary to trowel apply a small amount of oil as a base coat, normally however, one coat of oil applied with a rotary machine is sufficient to bring your floor back to life. A short while after application your floor will be buffed with a soft white pad to give a beautiful natural looking sheen. We only apply Pallmann Magic Oil which is a highly durable and chemically resistant product two component product. We do not work with cheaper single pack oils as these never cure and have little water or chemical resistance. 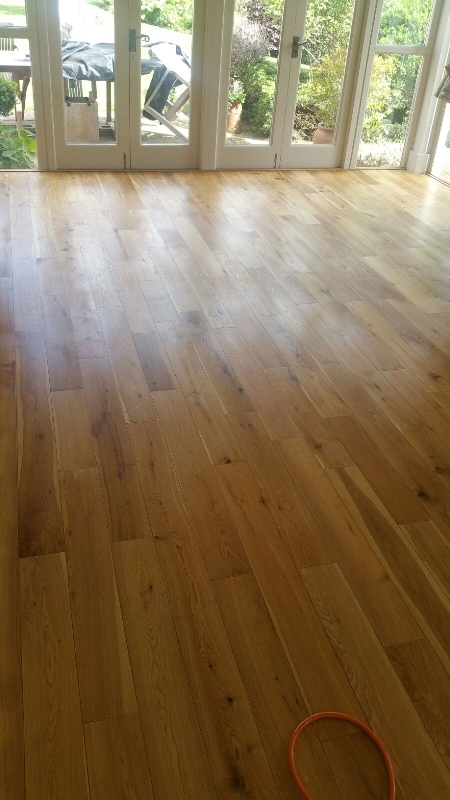 If it has been necessary to abrade the floor there may be some colour discrepancy however once the wood in this area has been exposed to sunlight for a period it will harmonise with the rest of the floor. Lacquered floors are not nearly so easy to do advanced maintenance on as oiled floors, if the finish has “broken through” to the wood at any point then the only answer is a full re-sand. However in many cases there are two courses of action available depending on budget and floor condition. Option 1) After cleaning two or three coats of acrylic seal can be applied in order to restore the sheen level to the finish and improve overall appearance. This is largely an aesthetic process as acrylic seals do not have the durability of lacquers. Many companies will do a clean, screen and re-coat, this works out cheaper than using a bonding agent but carries risk. It is reckoned that 1 in 50 of these jobs will fail due to lack of adhesion between the original finish and the fresh lacquer. Bonding agents virtually guarantee this will not happen and we have never had a failure with this process, if you require the cheaper option you may be asked to sign a disclaimer. Hard wax oils have the benefits of normal oils in that they can be patch repaired but generally speaking the product is rolled on like a lacquer (some may be applied by brush). Maybe it isn’t surprising then that the repair of these floors is a combination of the methods required for oil and lacquer. The process as always starts with a thorough clean followed by an assessment of the work needed. Like oils, any worn through areas will need to be lightly abraded to allow penetration, then one coat will be applied to this area. After drying (hard wax oils can be very slow drying) a further layer can be rolled or brushed across the whole floor and this will leave an even sheen level once dry. 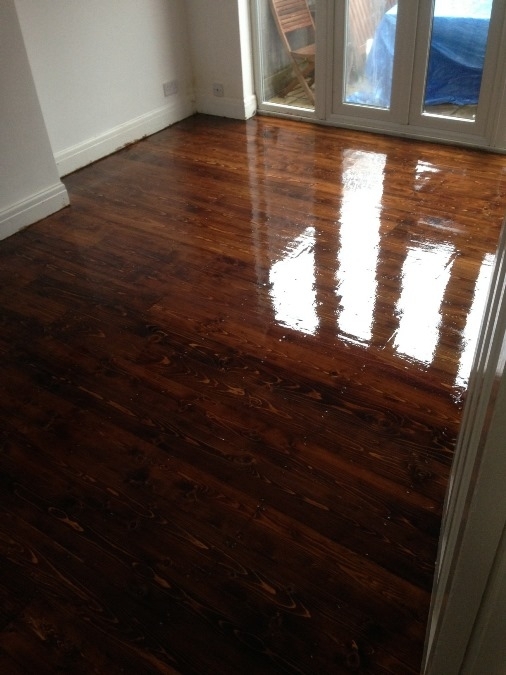 As with oiled floor there may be a colour discrepancy between the braded area and the rest of the floor, this should even out after a period of exposure to sunlight. If you would like a free evaluation of your wood floor contact us on 0333 9390193 or look for your local service provider to the right of this text.